What carrier services does Vet Medicines for Less use? The Overnight Shipping option is limited to Standard Overnight services only, and excludes First and Priority Overnight services. This means that only business days (Monday-Friday) are used in calculating transit times. Saturday delivery is available in certain, but not all, areas for an additional fee. If Saturday delivery is desired, please call Customer Service at 855-271-3880 to complete your order. Once my order has processed, when will it be shipped? Please note for Fed-Ex orders: Please add a comment in the space provided at the bottom of the checkout page if you wish to require a signature for orders under $199 or to waive a signature for orders over $200. Signatures are required for orders over $500 without exception. Vet Medicines for Less is not responsible for misdirected, weather-delayed, or undeliverable packages. Shipping charges are the responsibility of the customer. Please note once a product has shipped it is considered a complete sale. What are the terms and conditions of Vet Medicine for Less's $75 Free Shipping Offer? VetMedicinesforLess.com offers free shipping on qualifying orders of $75 or more within the contiguous United States. Certain items marked free shipping, perishable, drop ship, special order, and orm-d are not included in the $75 total. A handling fee of $1 applies to all orders. Oversize fees are listed on product page. Call for drop ship fees. Express delivery is available upon request. Perishable items can only be shipped 2nd day or next day. Other restrictions may apply. Call Customer Service at 855-271-3880 for shipping quotes or if you have questions about shipping your order. For orders placed over the phone, please refer to the shipping chart below. Orders to Alaska, Hawaii, APO/FPO/DPO Addresses, U.S. Territories and international orders are ineligible for free shipping. Please call 855-271-3880 for current rates. Most orders are processed within 48 hours. Orders are processed Monday through Friday excluding company-recognized holidays. VML currently recognizes the following holidays: New Year's Day, Memorial Day, Independence Day, Labor Day, Thanksgiving, the Friday after Thanksgiving, Christmas Eve and Christmas. Please allow an additional business day for order processing during these holidays. If you decide to cancel your order after the item has shipped, shipping costs will be charged. After you refuse the shipment and we receive the product back, your credit card will be credited the original invoice total minus shipping costs. See Returning Merchandise below for more information. Vet Medicines for Less reserves the right to refuse orders of excessive weight. Customers will be contacted and have the option of paying for shipping on the order. I've ordered a vaccine or other item that requires a cooler (refrigerated products). What do I need to know? Perishable items shipped Overnight Service are shipped Monday-Thursday. Perishable orders received after 11 a.m. CT on Thursday will be shipped the following Monday. Perishable items shipped Second Day Service can only be shipped Monday-Wednesday. Orders taken after 11 a.m. CT on Wednesday will be shipped on the following Monday. Please note: 2nd Day and Overnight orders cannot be shipped to a P.O. Box. Vaccines may be shipped on Friday for overnight delivery on Saturday, for an additional fee of $20. Please note that Saturday delivery is not available in all areas. Call 855-271-3880 to inquire about this service. Vaccines are Non-Returnable unless shipped by Overnight or 2nd Day Service. Orders shipped via Ground Service may take up to 10 days to deliver. Orders are owned by the purchaser upon shipment. Vaccines are temperature sensitive to extensive heat or freezing. In order to maintain viability, if experiencing either weather extreme, we recommend using Overnight Service. Please use caution if delivery is to an area with inclement weather conditions. Either contact customer service about a different delivery date or note on your order. I ordered a prescription for my pet. Is it returnable or refundable? All prescription items are Non-Returnable and Non-Refundable. Prescription items can only be shipped within the 50 states. Please allow an additional business day for processing of prescription items. If other items are included in the same order as a prescription item, the prescription item will ship separately. What is an oversized item? What are Dropship items (items shipped directly from the manufacturer) and how are they handled? Items marked as "Ships directly from manufacturer", must be ordered over the phone with a customer service representative. Shipping costs for drop ship items vary by manufacturer and/or distributors and subject to change. What is the handling fee? Effective June 13, 2011, each order processed through VetMedicinesforLess.com will be subject to a $1 handling fee. This fee covers rising fuel costs and will be applied to the shopping cart upon checkout. What other information is important for me to know? Please note: Vet Medicines for Less ships items from three different locations. If your order contains multiple items, be aware that they may ship separately and at different times. You will be notified and receive tracking information when your items have been shipped. Products that are marked ORM-D (Other Regulated Materials-Domestic) or LTD QTY (Limited Quantities) can only be shipped via ground carrier within the contiguous United States. They cannot be shipped to a P.O. Box or via any expedited method that may involve air transport. If you have any questions, please call 855-271-3880. Please note: Final totals for orders containing drop ship and special order items will be calculated by a Customer Service Rep. You will then be contacted via phone or email with final order costs. For orders Over $500.00 please CALL for shipping costs. Your Driver's License Number and State of Issue. No checks will be accepted if any of the above information is missing. 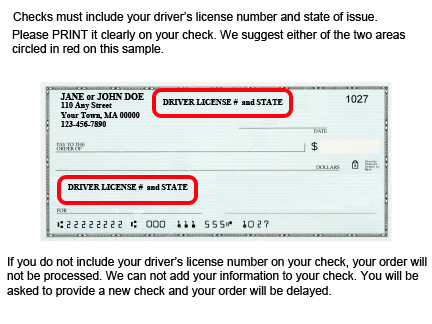 If your check is incomplete, your order will not be processed and you will need to send a replacement check. We apologize for any inconvenience, but we cannot add the information to your check. You must include it yourself. PLEASE NOTE ALL PRESCRIPTION ITEMS ARE NON-RETURNABLE and NON-REFUNDABLE. If you wish to return a product you need to obtain a Return Merchandise Authorization (RMA) number. Such RMA number is good for 10 days and must be written on the outside of the returning package. No returns will be accepted without an RMA number. All returned products must be in the same condition that they were received and in the original packaging. Please hold on to all packaging instruction manuals etc. until you are sure that you are happy with the products you have purchased. It is recommended that you use a shipping carrier that requires a signature for proof of delivery. Please note that return shipping charges are not included in the credit and it is your responsibility to pay for return shipping. Returned product may be subject to a 25% restocking fee. Returns/exchanges may take up to 6 weeks for processing and credit may be issued on account. Shipping charges are the responsibility of the customer. Any damage done to the product by the user will be deducted from the return. Please note once a product has shipped it is considered a complete sale. If you decide you want to cancel your order after the item has shipped you will be charged the shipping. After you refuse the item(s) and we receive the product back your credit card will be credited the full amount minus the shipping. Some products may be subject to an additional 25% restocking fee. Vet Medicines for Less is not responsible for packages that are stolen or lost after delivery. If necessary, you can have undelivered packages redirected: The United States Postal Service offers a service called Package Intercept which will, for a fee, redirect an undelivered package to your local post office or another domestic address. FedEx's Delivery Manager allows you to set a delivery time or redirect your package (for a fee), but will hold your package at a FedEx location for free. If you have no other options, provide instructions about a less visible location where your package can be left.